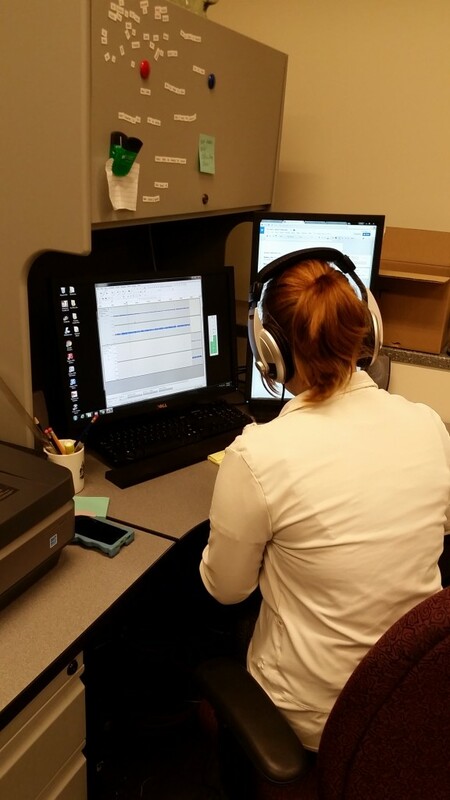 This is the first of two articles written by one of our student assistants, Andrea Dubs, who is working with us on the Mine Memories Oral History Project as our Audio Technician. She is responsible for much of the recording that we do during our interviews and refining audio files for clarity. I have been working with the Michigan Technological University Archives and Copper Country Historical Collections as a student assistant for a little over a month now, and I must say that it has been quite interesting. Even though I’ve only been here a short amount of time, I feel like I’m part of the family. Everyone is always smiling and has a happy greeting for you when you walk in. I am currently working as the audio technician on the Mine Memories Oral History Project. This project is really very interesting, listening to people telling their stories and realizing that it is their history has had a huge impact on me. When I first joined this project, I had no idea what to expect. I was in new territory but I was also prepared to learn new things. As the audio tech for this project, I had to first learn how to use the recorder that had been purchased. The recorder we are using is a Zoom H5. I watched several YouTube videos and skimmed through the user manual to work out the best ways to use the equipment in an interview setting. After learning how to use the recorder, I learned how to edit audio files in Audacity, a free open source audio editing software. To do this, I watched several tutorial videos. 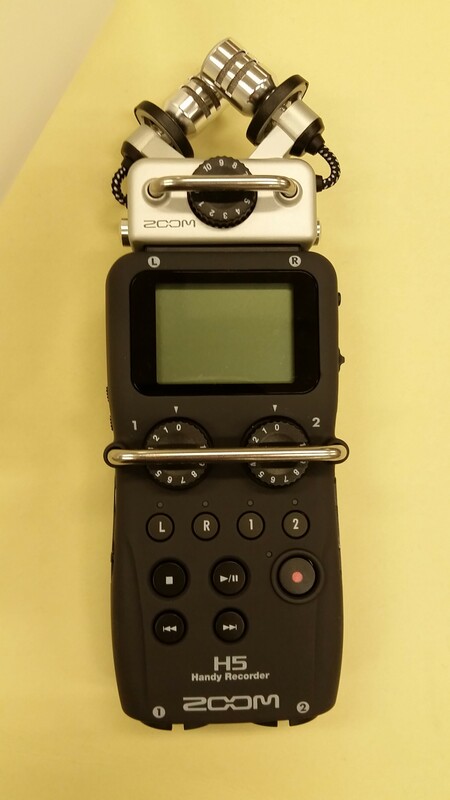 After familiarizing myself with the Zoom5 and Audacity, I started to think about how we would be using the recorder specifically in an interview setting. I worked out the optimal location for the recorder so that it could pick up the both interviewee and interviewer voices. We started asking questions such as: how can we minimize the effects of people tapping on the table? How can we minimize drastic sound shifts caused by coughs or sneezes? How can we equalize voices that are speaking at very different volumes, so the audio recording is easier to listen to for researchers? In order to answer these questions, Sawyer Newman (Communications and Research Assistant), a graduate student volunteer and I sat down to record several mock interviews. In these interviews, the interviewee and interviewer did different things that could occur during the actual interviews. For example, they did some table tapping and covered their mouths with their hands or spoke particularly loudly or softly. From these tests, we were able to determine the optimal location and input volumes for the recording equipment, which gave us a good idea about how much space we would need to conduct an interview. We also determined that we should use a muffler over the microphone, and place the recorder on a tissue box or stack of newspapers in order to minimize the effects of distracting sounds, such as tapping. Stay tuned for the second installment, which will be posted later this week. We are currently in the thick of the interview portion of our Mine Memories project. The Michigan Tech Archives’ oral history team has successfully completed interviews with six community members and has another interview schedules in the upcoming weeks. There are many more who have expressed interest in participating, though there is still room for more participants. Even more work has been going on behind the scenes, as we transcribe and digitally process the resulting audio files from our interviews. Keep an eye out for more blog updates about this project – as well as an upcoming student assistant’s accounts of working on the team. 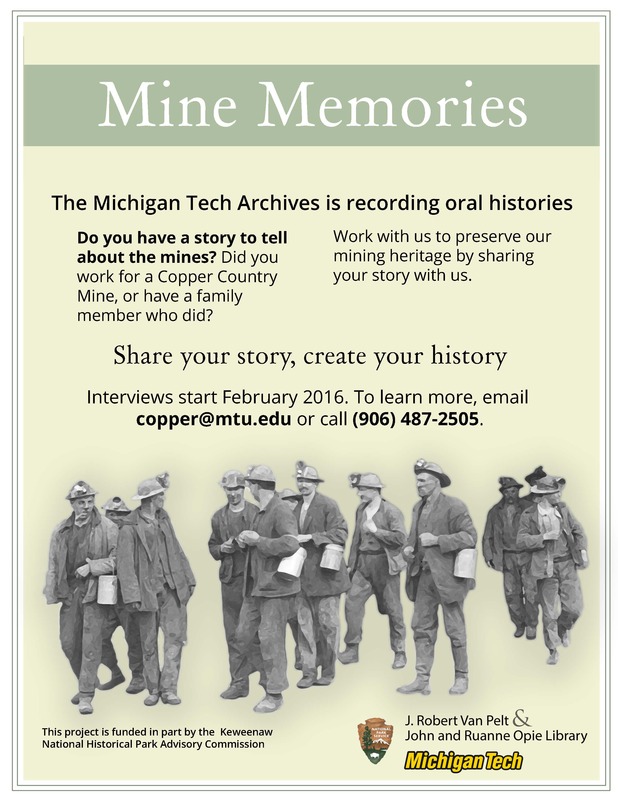 The Michigan Technological University Archives and Copper Country Historical Collections is pleased to announce that its staff will be initiating an oral history project this winter. This project, funded in part by the Keweenaw National Historical Park Advisory Commission, aims to collect first hand accounts from Copper Country mine workers and their families in an effort to preserve local mining heritage. 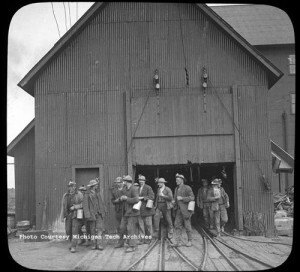 The Michigan Tech Archives has hundreds of cubic feet of mining company records within its collections but does not have nearly the same bulk of primary source materials characterizing mine workers and their families on a personal level. By reaching out to individuals who have stories to tell about the mines, the archives will give people agency over their own local history and will capture memories that would otherwise be forgotten. If you have worked for a Copper Country mine, or were close with a family member who worked for a mine, we would love to schedule an interview with you. We will be interviewing 15 people between January and May 2016. Interviews will be scheduled for 45 minute blocks in the Michigan Tech Archives. The interviews will follow a predetermined set of questions, but will allow for freeform discussion as well. If you are interested in participating, but are not able to travel to the Michigan Tech Archives, please let us know. We may be able to set up another centralized location for interviews within our community. If you would like to learn more about this project or would like to schedule an interview, please email the archives at copper@mtu.edu or call us at (906)-487-2505.